Another shot from the German Seigfried Line near Aachen, Germany. These concrete tank barriers are scattered throughout a long line in the forest. The barriers obviously did not stop the Allies from advancing. A thousand parachute jump performed by USA, Germany, and France, at St. Mere Igles, Normandy, France, 6 June, 2011. It was the drop site to occupy the Le Fiere River Bridge which was under German occupation in June, 1944. General Douglas MacAuthur returning to the Philippines 1944. The battle for the islands continued for many weeks which resulted in thousands of military casualties and also thousands of Phillipino civilians were killed. Flowers placed on the WW II American Cemetery in Luxembourg where General George Patton is buried. He was killed in December, 1945 in a vehicle wreck after the close of WW II. Photo taken on 31 May, 2010. My friend from Houston, Art Puccetti stands near the flowers. My good friend, Charles Kesselaer who lives in Margraten, Netherlands, stands near the site of an Oklahoma airman killed in action in the Market Garden invasion of Arnhem, Holland. Charles and many residents of Margraten have adopted and help care for over 7000 American grave sites at this location. Photo taken on 10 June, 2010 - The date on the photo is in error. Date wrong - Photo taken 7 June, 2011, of the German V-2 launch site near Boepple, France. It was a large facility partially underground. We walked through tunnels to reach to operational base. The V-2 was a very large weapon that delivered major damage to London and other England cities. 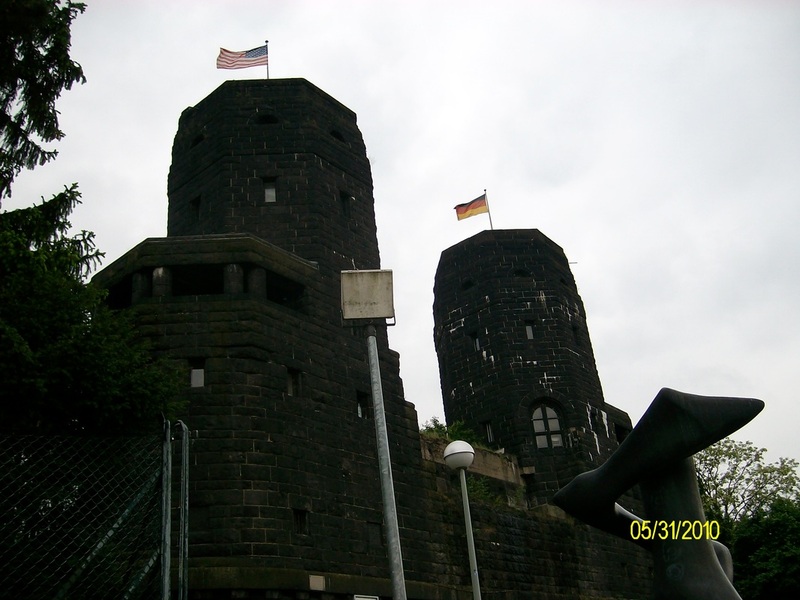 This is the west side of the River Bridge at Remagen. The bridge was destroyed but this portion remains and has a fantastic museum inside describing the battle scene. The Allies crossed the bridge before it was destroyed. This is the French side as indicated by the American and French flags above the bridge. I've been there two times, never gets old.